Man, I recently had my computer crash. I had everything on that machine. I was shifting through some you tube videos this evening and wouldn’t you know I found an old video of some buddies and myself. Boy do we look look young and it’s only been about four years. We fished a lot back then and fished hard. Not sure if I could hang today. Check out the vid and enjoy. Not every day on the water can be great. Some days it is just nice to be out in the sun, floating down a river. Other days you can have horrible conditions and the epic fishing makes it unforgettable. Those are the days that keep us going back. Sunday was one of those days. It rained virtually all day. It was a classic Blue Wing Olive day, overcast and rainy. Not too much rain that you couldn’t fish but just enough to keep things interesting. The day started out with a little nymph fishing. We were using a big pheasant tail and midge dropper under an indicator. The water was a little stained so we went a little larger on our fly size than we would have normally. Once the rain started, the blue wing’s began to hatch and we switched over to dry dropper rigs, using a split case bwo as our nymph. 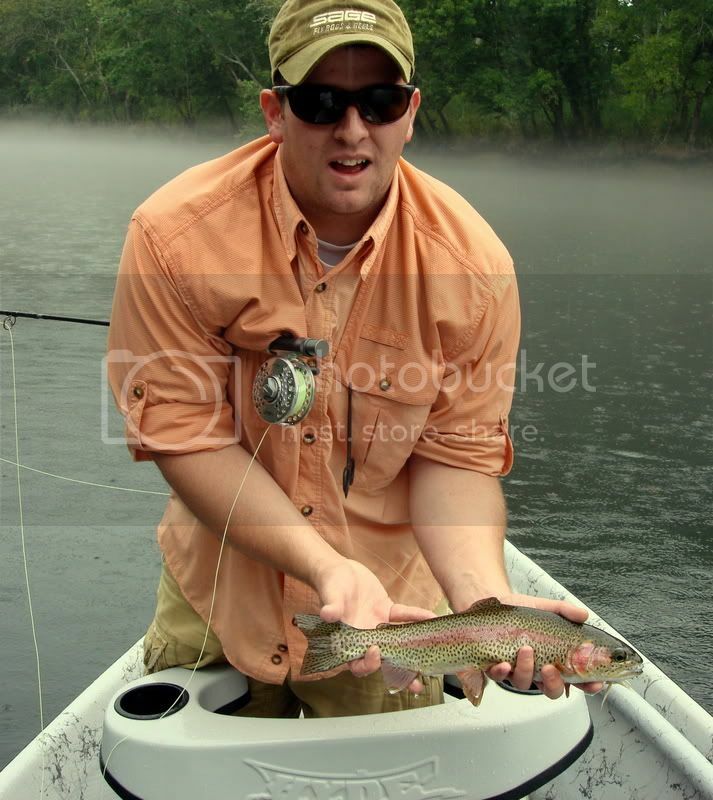 It was pretty easy picking off fish and the rain allowed us to get fairly close without spooking them with the boat. Jake and Clay had good luck using a san juan and midge I believe. They also threw streams and picked up some good fish. Towards Afternoon we watched Jake land a pig on a new streamer that he tied. It looked kind of girly to tell you the truth. Soon after the rain really started to pour and we all hunkered down under tree while enjoying a few beverages and telling too many lies. Upon starting to fish again I asked to borrow one of Jake’s girly streamers. Then wouldn’t you know the darned thing worked like a charm! I guess he might be on to something. No, really Jake is a pretty darned talented fly tier and fisherman. I am envious of his upcoming summer job also. To sum things up, it was a grat day despite the rainy conditions and we had a blast. I wish every trip could be that good. What happened to 33 degrees! Wow it was a frigid day on the Clinch. However we caught some fish and had a blast despite the cold temperatures. I don’t think it got above 30 degrees all day. Here is a few fish that fell for Pheasant Tails and Red Zebra Midges. On a whims notice we decided to float the Caney Fork today. Seeing as I’m headed out west for 9 whole days I just couldn’t bring myself to box the waders up for shipping two weeks early! My father, Doug Moore and myself all toted off to the Caney. 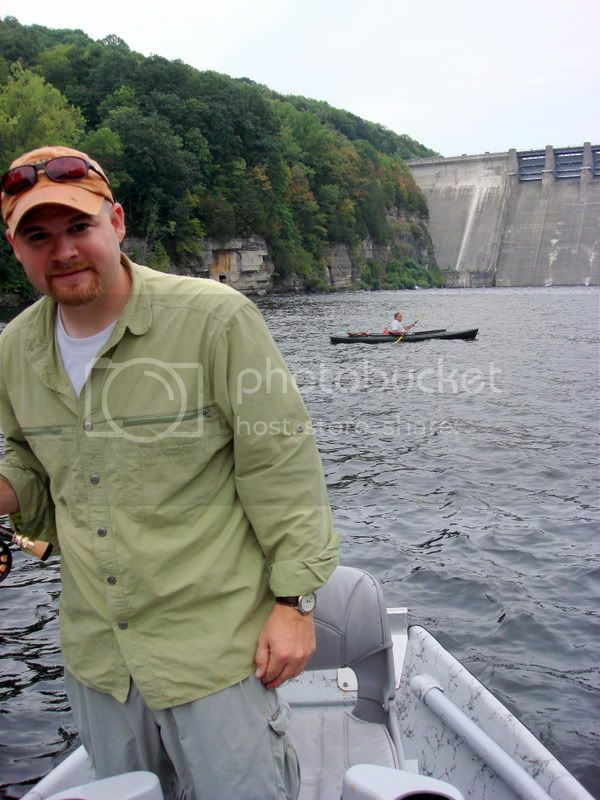 We started off early floating from the dam to Happy Hollow at around 9:30am with the generators cutting at 10am. Lemme tell you, when there pumping full steam, they are pushing some water! A sick amount of water…Not only were they pumping water they were sluicing as well to the tune of around 5300cfs (I think). At any rate the boat launch looked like a canoe/yak parking lot and everyone was looking at us and this funny looking boat! We quickly launched and I managed to snap a picture of the release as it was teetering off….that’s about a 15′ wall of water coming out! The wake was rising into the gun whales of the boat! The hatch we had to contend with all day! The big bug riding in the film behind Doug! 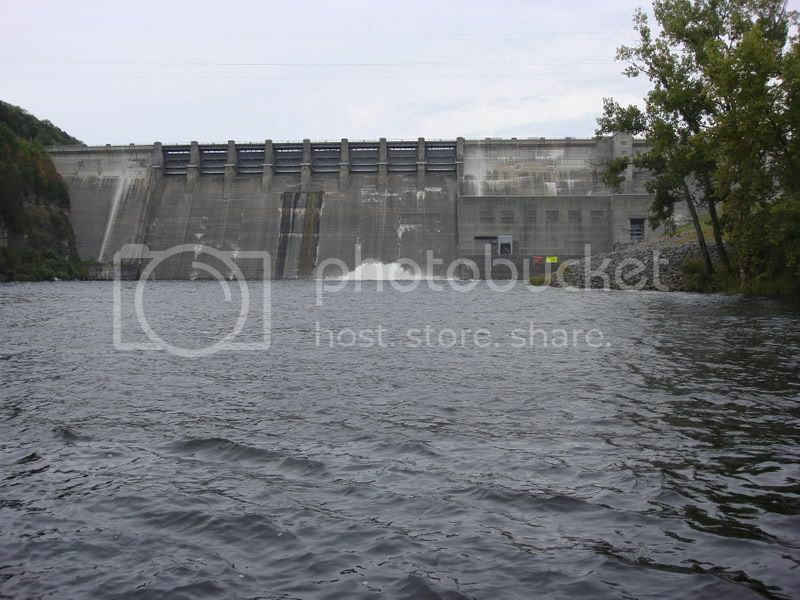 Just as the dam was almost out of sight they cut the water off and the current slowed slightly. Dad hooked into the first fish of the day in the first 15 minutes of our float! It put gigantic smiles on every ones faces as he had a FAT 16” brown tug tightly on his line!…………….Just about the time I started looking for my net! Oh crap, well so much for that….I forgot the silly thing at the house! You know that makes for a good day! Leave the net at home! Here’s a shot of that beaut of a fish! I believe I manned the oars till the halfway point of the float and Doug hadn’t managed anything off the back of the boat and wanted a break…So a break I gave him. 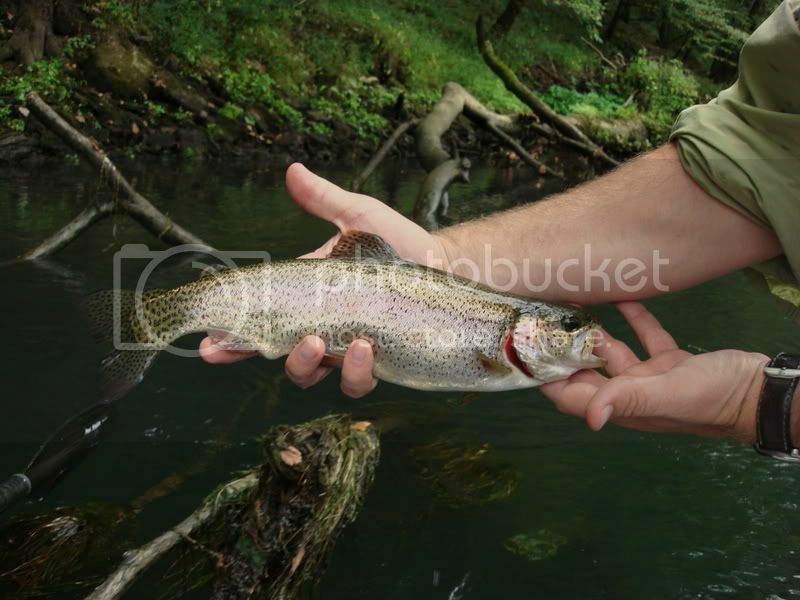 I had probably been casting for around 30 minutes and stuck a pig of a male brownie. 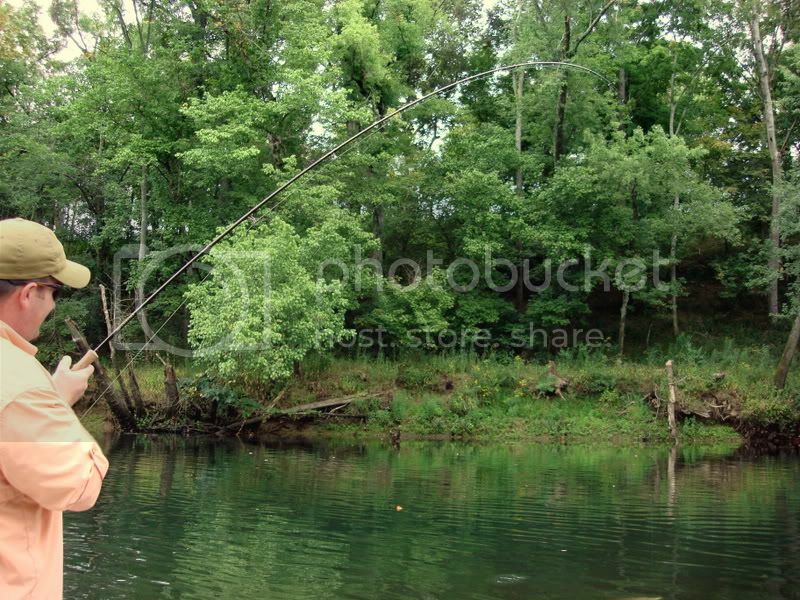 He put a nice bend in a 7wt Helios, and upon bringing him boat side he measured in at 20″! Beautiful coloration’s almost in full spawn colors! He’s forming what will one day be a nice ugly kipe! This is for your Doug, I cropped you out of my fish picture just like you said I would! 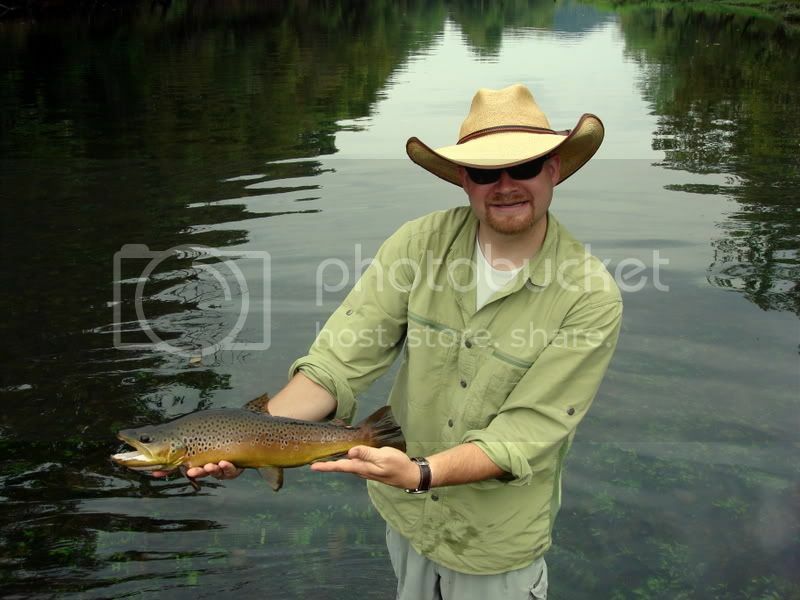 Gosh, a trout makes anybody look good! HA HA!I relinquished the rod at this point hoping Doug would get the S word (no I’m not referring to the 4 letter version I’m referring to the 5 letter word that ends in K and stinks when you hit one with a car!) Your welcome Doug! If you all haven’t already figured it out we left with him getting the S word! We floated over some really nice fish all day! Several really large browns, and bows! Dad managed to pick up some more nice fish throughout the day, all fat and ranging around the 10 to 14″ mark. 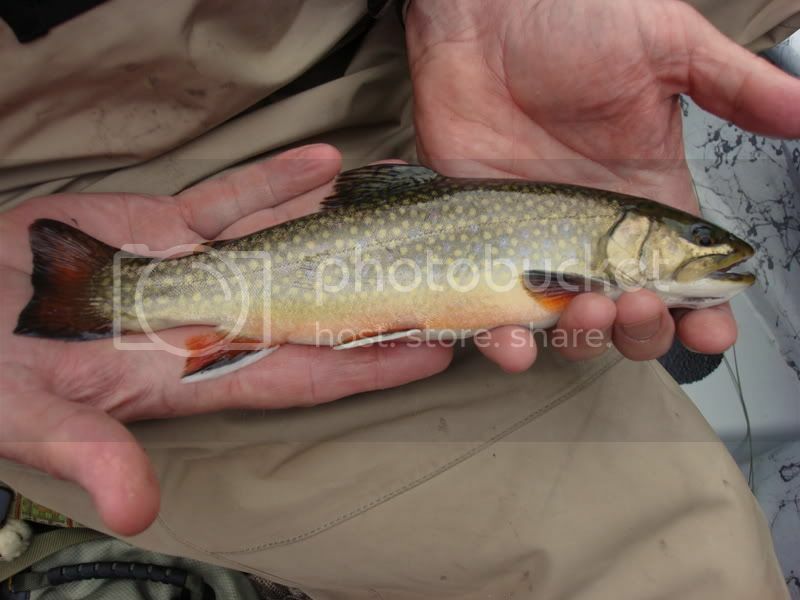 Including one beautifully colored stocked tail water brookie…These guys were amazing…Everyone one that got brought to the boat was gorgeous! Here’s some of that coloration! A little of Doug’s handy work! 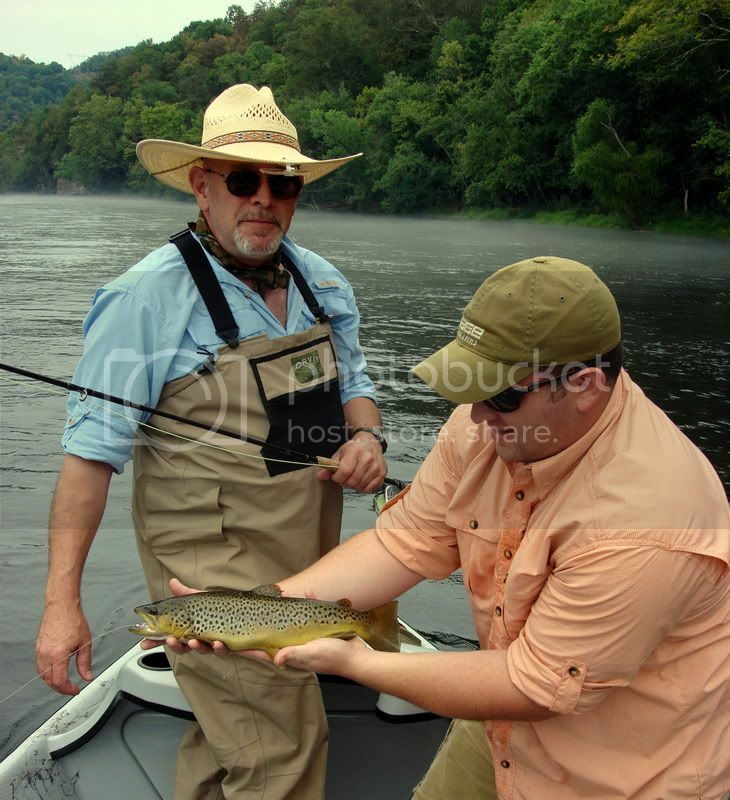 That fish landed dad his Caney Fork Slam! Here’s his bow! Doug got tired of ripping streamers and handed the rod back to me and I finished my slam about an hour before we took out! 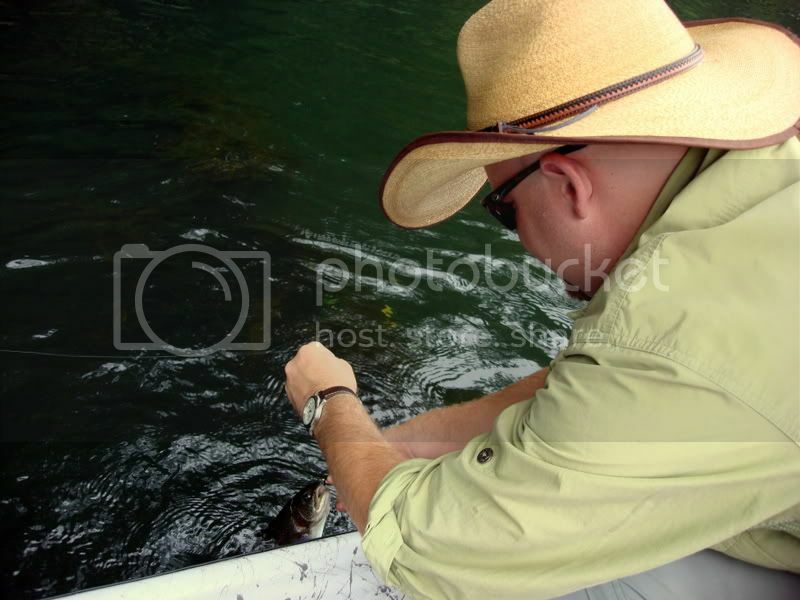 Landing a bow and, believe it or not, a brookie on a streamer the same size as him! Here’s one of my last fish for the day. So all in all, we had a darn good day! We got off the river around 7ish and packed it back in to Knoxville! I immediately went and dropped the boat off then rushed to get all my gear together to ship out! We leave for Yellowstone in less than 10 days guys! I’m sure we will have some excellent reports then! We are going to be fishing the Yellowstone for 5 days and then switching to the Big Horn River in Montana (floating it) for our last three days there! My heart races faster and faster the more I think about it! I’ve been day dreaming about it for weeks! Until then guys!